"This is my favorite split pea soup recipe. I love my pressure cooker and use it for meals that I need to cook for the family in a hurry. This is great for a cold winter's night, and it tastes great for lunch the next day. I serve it with French bread." Pour water into a pressure cooker. Add split peas, ham hock, onion, celery, thyme, garlic powder, and black pepper. Close cooker securely and place pressure regulator over vent according to manufacturer's instructions. Bring to high pressure; adjust temperature until regulator is gently rocking. Cook, about 30 minutes. Pour cold water over the pressure cooker to release pressure according to manufacturer's instructions. Remove ham hock and strip off meat; add to soup. Stir well to distribute flavors. Season with salt and hot pepper sauce. 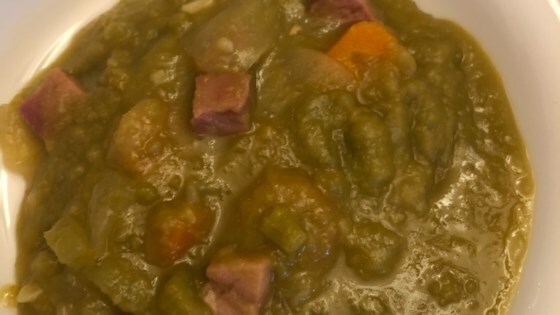 See how to make hearty split pea soup from scratch. Used cubed ham or a ham bone instead of the ham hock if preferred. Added some marjoram and cumin. Never never pour water on a hot pressure cooker. They could explode!! Unbelievable!